You could hear a pin dropan amazing thing when 14,000 people are gathered in one place. All was quiet among the standing-room-only crowd at the 2005 Esri International User Conference as the audience held its collective breath in anticipation of the opening remarks of Dr. Jane Goodall in her keynote address. Then it came: part screech, part songa warm "hello" in chimpanzee. The unusual greeting broke the ice and the silence melted into a warm round of applause. An icon of environmental conservation and sustainability, Goodall told her story. In June 1960, anthropologist and paleontologist Dr. Louis Leakey offered her the opportunity to study chimpanzees in Tanzania (then Tanganyika). Her work at what would become the Gombe National Park would become the foundation of future primatological research and redefine the relationship between humans and animals. After 45 years of study, Goodall and fellow researchers have amassed an extensive collection of behavioral and demographic data on chimpanzees. "The most important thing is how much like us they are," Goodall told the conference. "In biology, they are more like us than any other creature. Their postures and gestures have the same context. They swagger. They pat each other on the back. There are strong bonds between mother and childbonds that persist throughout life." One of Goodall's most significant discoveries came in her first year at Gombe, when she observed a male chimp, whom she had named David Greybeard, making and using a simple tool. He stripped a leafy twig, hunched over a termite mound, and used the tool to carefully fish out termites. Jane called this "the breakthrough." Until then, it was thought that only humans used and made tools. When she told Leakey about the Gombe chimps making and using tools, he replied, "Now we will have to redefine 'tool,' redefine 'man,' or accept chimpanzees as human." 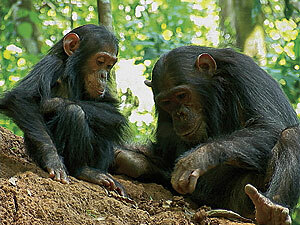 Gombe and Mahale mountains are the only national parks in Tanzania with chimpanzees. 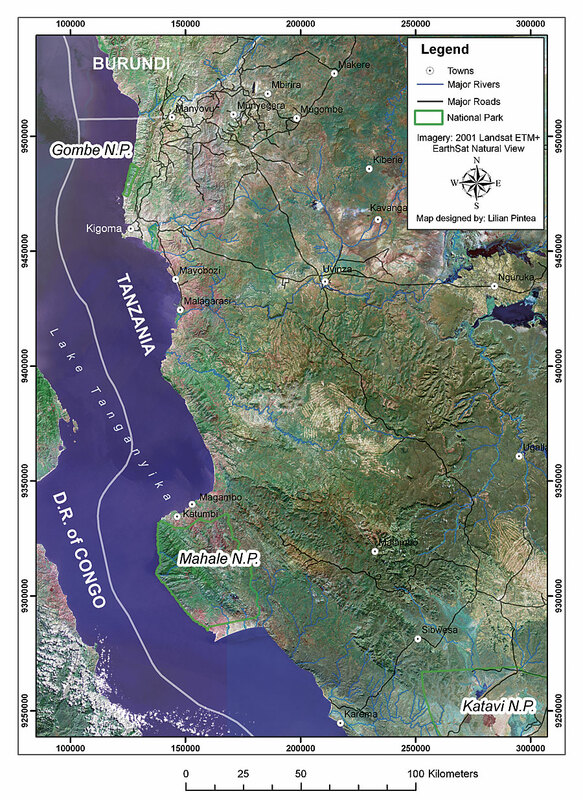 Most of the chimpanzee populations in Tanzania are outside protected areas and in urgent need of conservation (spatial analysis by Lilian Pintea). But as Goodall described her amazing observations, she pointed out that the chimpanzee population was "vanishing as we speak." What was once a population of one million is now down to 150,000. "There are many reasons why they are disappearing," according to Goodall. One of the greatest threats is the illegal commercial bushmeat trade. Roads are being cut into previously inaccessible places in the forest. The roads bring hunters who trade in bushmeat. "The forests are becoming empty of life," says Goodall. According to Goodall, another important concern is habitat destruction. Habitats are becoming fragmented as more land is converted. Groups of chimpanzees have been cut off from each other. 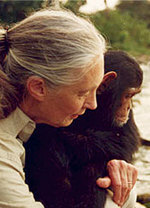 In 1977, Goodall established the Jane Goodall Institute (JGI) (www.janegoodall.org), which supports the Gombe work and other research, education, conservation, and development programs. These include community-centered conservation efforts in Africa that provide villagers tools to build sustainable livelihoods while promoting regional conservation goals such as reforestation and an end to the illegal commercial bushmeat trade. "Our challenge is to spread the message," says Goodall. 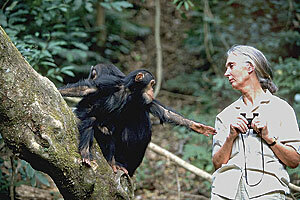 Photos courtesy of the Jane Goodall Institute (Sanctuary chimpanzeeJane Goodall does not handle wild chimpanzees). Ten years ago, JGI created the Lake Tanganyika Catchment Reforestation and Education (TACARE) project, which creates community-centered conservation programs to preserve and restore the environment while giving hope to thousands of families. TACARE makes local involvement an integral part of the process. "The villagers recognize that habitat is being lost, but they are living on the edge as well and the situation is dire," says Goodall. TACARE's ability to improve the quality of life for more than 170,000 people has been commended by the President of Tanzania. Working with the Dian Fossey Gorilla Fund International (www.gorillafund.org), JGI expanded the TACARE model to underserved areas of eastern Congo. Jane Goodall Institute also created Roots & Shoots (www.rootsandshoots.org), a program that supports students from preschool through university in projects that benefit people, animals, and the environment. There are 7,500 groups worldwide in 91 countries. "Roots & Shoots gives me the energy to travel 300 days a year," Goodall told the audience. She also noted that, while there may be more problems in the world than ever, there is also hope. "It is in our hands," she said. "And with the GIS technology you present, we can change the world even faster. Every individual counts. Every individual has a role to play. Every individual makes a difference. For the chimpanzee children and the human children, we cannot wait any longer." For ways to assist JGI, please visit the Jane Goodall Institute or use this contribution form. See also "GIS in Chimpanzee Research and Conservation at JGI." Dr. Jane Goodall Special Edition DVD is now available.